Rocky battles his most powerful adversary yet - the ferocious Clubber Lang, played by none other than Mr. T! For what may be the most exciting and fast-paced film in the series, Sylvester Stallone writes, directs and stars with explosive passion and intensity. As Rocky Balboa (Stallone) fights his way into the hearts of millions, life couldn't be better. He scores ten consecutive wins, lands lucrative endorsement contracts and becomes famous the world over. But when Clubber Lang K.O.s Rocky in a humiliating defeat, it becomes apparent that he has lost his edge. Considering hanging up his gloves, Rocky receives encouragement from an unlikely ally: his old nemesis Apollo Creed (Carl Weathers). With Creed's help, Rocky strives to regain the "eye of the tiger" before confronting Lang in a grueling rematch for the world heavyweight championship. Featuring strong performances by TaliaShire, Burgess Meredith, Burt Young and Hulk Hogan, this hard-hitting actioner comes out swinging with adventure, humor and emotionally-charged human drama. $16.015 million on 939 screens. Lovers of kitsch will be delighted with 1982’s Rocky III. Not only does it present one of the Seventies’ iconic characters in our titular hero, but it also marks the first appearances of two Eighties biggies: Mr. T and Hulk Hogan, two performers who would soon jettison any forms of credibility and become cartoons. All that and one of the decade’s cheesiest songs via Survivor’s “Eye of the Tiger”! Historical significance is really all that this sequel has going for it. Many folks seem to find RIII to be one of the best of the series, but frankly, I don’t know why that is. I thought it was a soulless product designed to do little more than generate profits and pad writer/director/actor Sylvester Stallone’s ever-growing ego. As Rocky III begins, we see how Rocky (Stallone) deals with the good life. His prosperity is the result of the world boxing championship he won at the end of Rocky II, and he also continues to thrive as a fighter. 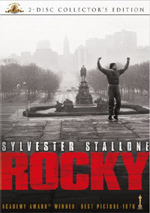 Oddly, the first sequel also looked at Rocky’s success after the first fight seen in Rocky, but although Rocky experienced serious difficulties at that time, we find no such obstacles now. For reasons unknown, he’s much better to handle the wealth and attention on this occasion. In fact, Rocky seems to deal with his status too well, and he becomes soft as a fighter. Tough challenger Clubber Lang (Mr. T) confronts Rocky and gets a shot at the title, which he easily takes from the champ. After that, Rocky swirls into doubt and minor despair before he regains the “eye of the tiger” and is ready to reclaim his crown. Yawn. I disliked the fact that the first sequel tried so hard to cast Rocky back in the underdog role, but this aspect of the third film makes it even more tiresome. (And I haven’t even gotten to the fourth and fifth movies, both of which do the same damned thing!) However, this problem becomes even more dismaying in RIII because of Stallone. At least in RII he attempted to play Rocky as the same kind of lovable lug we saw in the original. By 1982, all vestiges of that character have completely vanished, and it’s clear that Stallone is simply performing a version of himself. The story can try to cast this Rocky as an underdog, but it can’t make us like him. I still had some affection for the character as seen in RII, but Stallone’s cold and mechanical performance here kept Rocky distant and remote. I guess Stallone’s ego wouldn’t allow him to show the kind of emotional simplicity that made Rocky so winning in the first place; he’d much rather let us see how muscular he’d become and revel in the many slow-motion shots of himself looking hunky. Rocky II began the process through which the supporting characters were diminished in magnitude, and RIII furthers it. Rocky’s wife Adrian (Talia Shire) once existed to show the soft and tender side of Rocky, whereas now she’s there just because the movie’d look weird without her. Adrian does nothing more than cheer for Rocky on occasion and tell him how great he is. Otherwise, the character has no dimension. Paulie (Burt Young) and Mickey (Burgess Meredith) also appear for little reason than convenience, though the movie does attempt to churn some easy emotion from Mickey’s demise. Rocky’s old opponent Apollo Creed (Carl Weathers) gets a step up here, as he takes over Mickey’s role and trains Rocky for the rematch with Lang. However, I don’t think this occurs for any sort of real plot reason. Instead, I think Stallone killed the old man just because this meant he could have some photogenic shots of two muscular men as they trained together. The increase in screen time does nothing to expand upon the character of Creed, and frankly it’s more than a little odd to see the two of them become such quick pals. Creed absolutely hated Rocky in the first sequel, so this new relationship seems like nothing more than a matter of convenience. Not all of RIII is negative. I’d forgotten how intimidating Mr. T could be back before he became a joke; he makes Clubber seem ferocious and terrifying. In an underwritten role, T fleshes out the part well and creates a distinctive and compelling personality. In fact, he’s so good that he aptly shows how little life Stallone brought to Rocky in this outing. While this means that I never really bought Rocky as a threat to Lang, it does make for a good climactic fight sequence. The end-battle in RII came across as too slick and clean, but the finish to RIII actually appears to be quite rough and impassioned. Unfortunately, it’s the only part of Rocky III that shows any life. The rest of the flick is a lifeless ode to Sylvester Stallone. Rocky used to be a warm, human character, but Stallone’s ego mangled him into a numb robotic creation with no spark or joy to be found. The same goes for most of Rocky III. It has some moments of excitement, but most of it seems like an ad for workout equipment, and it leaves me cold. 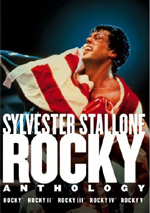 Rocky III appears in both an aspect ratio of approximately 1.85:1 and in a fullscreen version on this double-sided, single-layered DVD; the widescreen image has been enhanced for 16X9 televisions. Only the latter was examined for this review. The picture of Rocky III suffered from a variety of other flaws that rendered it only a little above average. Sharpness was one of the main concerns. Although parts of the movie appeared to be adequately crisp and well-defined, quite a few shots came across as soft and hazy. The film never seemed to be excessively fuzzy, but I thought it often lacked the detail I expected. At least no moiré effects or jagged edges caused problems. In terms of print flaws, minor various examples of speckles and grit could be seen. Grain was a bigger distraction, however. Colors appeared bland but acceptably accurate. As with the other Rocky flicks, hues weren’t terribly prominent, as the various settings didn’t lend themselves to vivid tones. Actually, this sequel had the most opportunities for bright colors to date, but it didn’t take much advantage of them. The hues looked adequately clear but somewhat flat, without much spark or power. Black levels were generally drab and bland, and shadow detail could become rather heavy and thick. None of the film’s various concerns were excessively prominent, which is why I still felt comfortable awarding Rocky III a “B-“ score for picture. However, I found it to be a disappointment, as the anamorphic transfer and high budget enjoyed by the movie should have resulted in something more satisfying. Also flawed but decent was the Dolby Digital 5.1 soundtrack of Rocky III. On the positive side, the movie presented a fairly terrific soundfield. The front spectrum displayed a great deal of activity, especially during the various fight scenes. The score and various songs showed solid stereo imaging, and effects often blasted from all five channels. There wasn’t a great deal of panning across the front speakers, but the audio melded together effectively, and the surrounds kicked in with quite a lot of information during appropriate sequences. Check out the bits when Rocky becomes woozy to hear some nice five-channel activity. Unfortunately, the quality of the audio left something to be desired. Although dialogue consistently seemed intelligible, it also appeared somewhat rough and edgy throughout the film. The same problems affected effects, which could appear thin and mildly distorted. Decent low-end accompanied a few elements, but most of them were tinny and flat. Music displayed similarly shrill tones. Some of the songs showed decent bass, but the edginess of the higher parts of the music took away from any form of depth. The strong soundfield bolstered this one to “B”-level, but the quality of the material disappointed. Less satisfying were the DVD’s extras. All we find on this disc is the film’s theatrical trailer. I want my Mr. T audio commentary! Frankly, some cool extras would have made this package much more palatable than it was. As it stands, Rocky III offered a good climactic fight scene and a nicely brutal performance from Mr. T, but otherwise it seemed mechanical and empty. No signs of the title character’s original charm and warmth existed by this point, and the result was a sequel that connected to the first film in name alone. The DVD provides decent to good picture and sound plus virtually no extras. Ultimately, Rocky III is best left to the series’ completists. Note that this particular disc currently appears only as part of “The Rocky Anthology”. That five-DVD set includes the first flick and its four initial sequels. Note that I believe this disc – and all the others – are identical to versions released in February 2005. I didn’t see those so I’m not positive, but that’s what I’ve been led to believe.